Shlomit Chaushu, Home Ulpan founder and directors was born in Haifa Israel. After serving in the IDF intelligence service, Shlomit received a B A. in Hebrew and Arabic at the Haifa University. 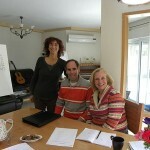 She is a Hebrew teacher with more then 25 years of experience. She has taught Hebrew in various settings, including at the Ulpans of the Jewish Agency ,with SELA, and etc. The last few years she has taught as an instructor of Hebrew in the International School of Haifa University, in the Technion – Israel Institute of Technology, and in the Open University. Shlomit has a love of teaching Hebrew and as her students say: “creates a warm, encouraging and creative environment in which to learn the language.” She encourages her students to speak Hebrew by practicing speaking, in real situations. 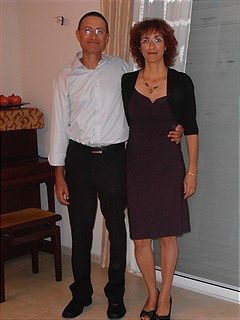 She has taught Hebrew to thousands of students, and in the past 7 years of Home Ulpan she has taught hundreds of students, who acquire their Hebrew skills quickly, with her unique method Thanks to both professionalism and the warm welcome into her family, a lot of students, return every year to improve and practice their Hebrew. Fully dedicated to cater each student’s needs. Shlomit is Maried to Shimon and they have 3 grown children and a cute friendly dog. He is very friendly, love people, to smile, laugh and enjoy. ”Excellent–I think Shlomit is a master of figuring out what a student needs and providing it to them in a very low-key but sneakily persistent way…. She used a red pen to correct my essays! She listened to me talk about my day and wrote down my mistakes! I loved it. Consider this a hearty endorsement…”Martha Moody, famous writer and Dr. Martin Jacob, Daiton, U.S.A.